What a fantastic little Bookshop we have here at the Relaxation Centre! It’s like a kind of Aladdin’s Cave, full of wonderful exotic and undiscovered treasures. This exceptional little Bookshop is the work of many passionate people from various walks of life – that is what makes it so unique. We have added a table and chairs to the middle of the shop so you can come in, sit down and enjoy browsing through some of the wonderful books we have here waiting for you. Many people tell us that whereas they’ve seen so many of their friends turn to technology instead of books they just love the feel of a book in their hand, and if it’s one of those special books they like to have it beside them when they wake up or go to sleep at night. This gives them that little bit of inspiration or reminder of what they need to focus on. Some people say that that one or other of our CDs they love to play in the car if they’re on their way to a certain appointment. Others say that if they need a little bit of a chuckle they’ll put on a particular CD, (for instance Release and Let Go). People have told us that they like to play CDs whilst they’re ironing as it gives them something uplifting or entertaining to focus on in those moments. There are those who love the Sleep CDs, – ones that give them ideas of what they need to do and practise to bring sleep or music to relax their bodies by. Books, CDs and DVDs can be full of ideas, inspiration, hope and reminders of our qualities and capacity to handle change and challenging moments. We’ve even heard people say or write to us that a certain book or CD or our Newsletter has helped them to survive through several of their worst years. In these times its these aids that remind us we’re part of a human family and we are never alone. Here are the dates where we reduce all our prices in the Shop by 20%. Tuesday 22 January to Friday 3 February 2019 and Monday 18 March to Saturday 6 April 2019. If you need something and can’t find it just give us a call and if possible, we’ll track it down for you. Our team will always do their very best. 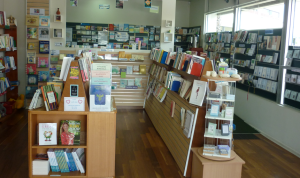 Enjoy our Books, CDs, DVDs, Cards and more. We love to see you here.